This Forza ottoman by Warehouse of Tiffany is the ultimate in comfort and style. Simple but elegant, its foamy leather, cube shape and artisan work with accented crystals is great for accentuating any decor for better ambiance. 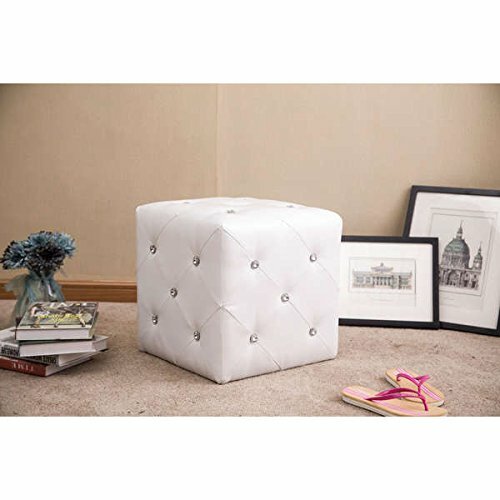 This ottoman stool with crystal accents is a versatile piece of furniture that can be used as a footrest, an extra place to sit or an end table in your living room or bedroom. The crystal accents in the tufts of the ottoman add a glamorous note to the room's decor. If you have any questions about this product by Warehouse of Tiffany, contact us by completing and submitting the form below. If you are looking for a specif part number, please include it with your message.